GEOWEB® tiered wall structures are designed with an open facia for vegetative growth and natural aesthetics. GEOWEB retaining walls are structurally-sound and perform well with differential settlement in soft-soil environments. Design vegetated reinforced and gravity walls that retain structural integrity even in poor base conditions with GEOWEB® Retaining Walls. 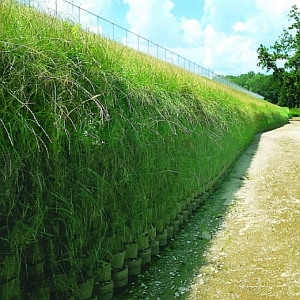 The GEOWEB system’s open-celled terraces create a natural environment for sustainable vegetation and allow storm water infiltration. GEOWEB walls conform well to landscape contours, are resistant to environmental degradation, and install 25-30% faster than MSE block walls.